TeamSupport offers powerful reporting and charting capabilities through an integration with Zoho Reports. Through this integration you can create custom reports, charts, and dashboards on a variety of TeamSupport data and you can also create custom dashboard which you can share throughout your organization. Once the integration is set up, TeamSupport will automatically update Zoho Reports in near real time so the data will be fresh and not time delayed. Zoho Reports is an add-on to your TeamSupport account and plans can be purchased directly from Zoho. Smaller TeamSupport accounts will be able to use the free account, but that is limited to 10,000 total records, and since we send over more data than just the tickets that threshold can be reached fairly quickly. Setting up the integration is straight forward – First, you will need to get an API key from Zoho. In the event that you will need to delete a ticket from TeamSupport, please be aware that the ticket data row will need to also be manually deleted from Zoho. This is because TeamSupport cannot delete the ticket data row in the ZohoReports account through this integration. 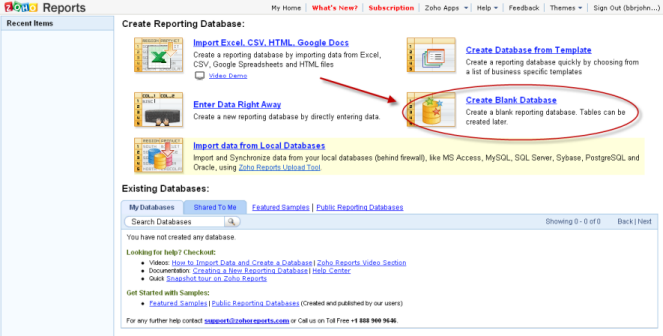 Log into your Zoho Reports account and you should see a screen like the one below. Once you have named the database TeamSupport, click on the “Create” button and the blank database will be created. !If any of the tables created by this integration gets renamed the integration will create, and continue updating, a new table with the original name and the renamed table will not get any further updates. Copy the “AUTHTOKEN” field and log into TeamSupport (with an Admin rights user account). Zoho Password: The password will be your Zoho API Key (which you copied from the steps above). Make sure to check the “Active” box. Zoho Reports Authentication Token: The Authentication Token will be your Zoho API Key (which you copied from the steps above). Grid: This field has the values “US” and “EU”. The default is US. This value affects the hostname. If US is selected, .com will be used for the hostname, and iif EU is selected, .eu will be used for the hostname. Send Ticket Custom Fields: Check this box if you would like to send Custom Ticket Fields to Zoho. Active: Make sure to check the “Active” box in order to start the integration. Ticket Status History – Every time the status of a ticket changes, we log a record into this table. This allows you to keep track of how long tickets are kept in certain statuses. Knowledge Base Traffic – Tracks each time a customer views a knowledge base article and what keyword they used to find the article. Within about 15 minutes the initial data should be loaded into your Zoho account and you will be ready to create graphs and reports in Zoho Reports.